Today I received the sweetest surprise! My doorbell rang and I saw an Amazon box sitting on my front porch. I was a little perplexed because I couldn’t remember ordering anything, but my name was on the label, so I went ahead and opened the box. Oh my goodness! Inside the box was a sparkled, spotted gift bag shimmering in silver and grey with a perfectly tied bow at the top. Who on earth would send me a gift… and why? It’s not Mother’s Day, Teacher Appreciation Week, or even Christmas. I stood there for a moment, savoring the anticipation, pondering what could be inside and who might be the giver. I almost didn’t open the bag because the thrill of suspense was so great! When was the last time YOU received a surprise? No, not a birthday or Christmas gift. A surprise. A completely unexpected, unanticipated, little something just for you with no holiday or season attached. Did you feel a range of emotions? Did it make you smile? Did it make you want to do something nice for someone else? I absolutely LOVE surprises, but they are few and far between. We all lead such busy lives and it’s easy to just go about our business assuming people know we appreciate them. Today’s surprise today filled me with pure delight. I immediately felt childlike joy, knowing that someone, somewhere was thinking of me. It was then that I read the note attached to the bag. It was a gift from a dear friend, Courtney, who used to work at my school several years ago. We’ve kept in touch through social media and even met for lunch last summer. Her note thanked me for our friendship and inspiration as a kindness ambassador. I have to admit, it is much easier to give than to receive! I carefully untied the bow and peeked inside the bag, my heart already bursting at this random act of kindness so thoughtfully chosen for me. Then I felt tears in my eyes as I saw what was inside. I immediately thought of Todd Nesloney, who purchased this book as a surprise for his mom, but it was delivered after she passed away. Then I thought of the blog post I wrote back in November, reflecting on the ways we can be an umbrella in someone else’s rain. Just yesterday I shared reflections about my mom and how the date marked 11 months since her passing. With each new month, I am reminded of loss, grief, and resilience to keep pressing on. “Maybe I can only do small things. Friends, your small things matter. Oh, they matter so much! This thoughtful gift from my friend reminded me of my purpose and her umbrella of kindness did indeed shelter me from the storms of my heart. Go out there and be the good. Do your small acts of kindness and know that you are scattering seeds that will bloom in people’s hearts brighter and bolder than you can even imagine! And when your small things and my small things and their small things all join together… this is what changes the world! 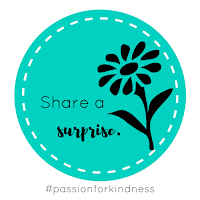 Be blessed and share a surprise with someone you know. I guarantee it will absolutely make their day just as this surprise made mine!